Never one to back away from humorously uninformed hogwash, Fox News has run a new article suggesting that young voters might skip the polls to spend time playing the newly released Xbox 360 game Halo 4. How have they arrived at this provocative conclusion? Because they talked to some people! Um, experts! A PR guy! Some wrestler on Twitter! This is clearly cause for alarm. The article begins by wondering about the curious coincidence that Halo 4 is being released on election day, November 6. "Microsoft insists the Halo 4 release date is a happy coincidence," the Fox reporter writes, "but some experts wonder whether the franchise is an unwelcome distraction for both parties, especially with the Halo fanboys." Well, we all know that the minute "some experts" start "wondering" about things, we'd better buckle up. First up is Mark LoCastro, described in the article as a public relations manager. His contribution: "I'm not voting this year, And if I look at the guys I game with and guess whether or not they'll vote, [only] about three out of eight will vote." Nice guesses, Mr. LoCastro. Have fun not voting, I guess. "The idiots who can't get a date and look at the women's breasts in the games will definitely find Halo 4 more interesting than something that requires thinking," he said. But Peddie cautioned that most younger adults are likely to make the right choice. "The majority of young adults, especially the ones voting for the first time, will go to the polls," Peddie told FoxNews.com. I love this guy, mostly because even after slinging a bunch of half-assed assertions, he still backs off in the end and says that the majority of people will vote. And I mean really, who among us doesn't spend many a dateless night looking at the women's breasts in the games? While no one has hard data on whether Halo 4 gamers will influence the election, there is a logical argument that suggests Halo 4 could have some effect. Tech analyst Charles King says recent polling data suggests that younger voters are already less interested in this election cycle than they were in 2008, and that gamers might decide to buy the game and skip the vote all together. Furthermore, which polls are specific enough to tell us whether or not gamers are likely to skip voting to play Halo 4? The made-up polls in your head, that's which polls. Microsoft, to their credit, stand up for themselves, pointing out their many efforts at voter registration, including a voter outreach program on Xbox Live. And although the interactive questions they kept playing during the debates may have been annoying, at least they aired the debates in the first place. 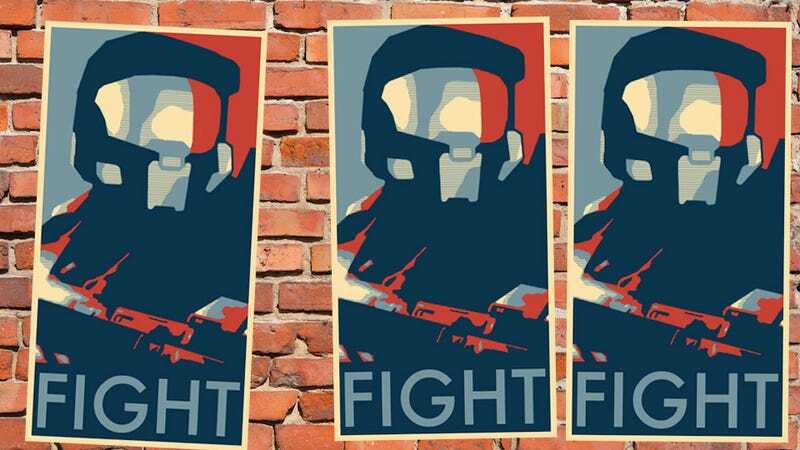 Halo 4 is coming out on voting day. Yes, yes, what a sinister coincidence. I'm sure it could have nothing to do with Microsoft's entirely nonpartisan agenda to make lots of money, and is in no way influenced by the fact that Black Ops II releases next week, or the fact that video games almost always come out on Tuesday. No, this is clearly some sort of… organized effort… by Microsoft… to keep young people from voting? I'm actually trying to take this article to its logical conclusion and can't quite find one. While no one has hard data on whether Halo 4 gamers will influence the election, there is a logical argument that suggests Halo 4 could have some effect. Aah, yes. The logical argument. How silly of me to lose sight of that. I'll turn it over to you all: Anyone out there voted? Did video games affect whether you did or not?